DALLAS, TX--(Marketwired - Jun 25, 2015) - New research reports from Parks Associates covering OTT services, home robotics, smart watches, and connected health provide in-depth analysis of industry trends and consumer research, forecasts, business model strategies and opportunities, and key recommendations for players within these key connected home topics. 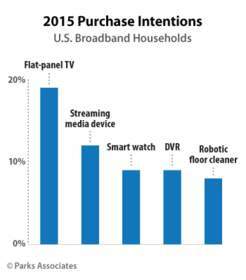 Parks Associates research finds that the average U.S. broadband household owns approximately seven connected devices and that consumers will continue to buy connected devices to address more specialized needs, such as fitness services and multiscreen video consumption. The connected home industries will need to continue to innovate to drive interoperability, ease of use, and consumer engagement. "Today's consumers want innovative connected technologies and services that work intuitively and seamlessly, which creates exciting opportunities for connected home industry players," said Stuart Sikes, President, Parks Associates. "Our research analyzes the evolving connected home market, plus the global trends revealed in our consumer data, to provide the best strategic recommendations to technology manufacturers, service providers, and retailers in the connected home space." TV Everywhere and the New World of OTT examines trends in OTT video services and TV Everywhere, including operator moves, new entrants, content implications, viewer behaviors, and consumer spending. Smart Home Platforms for Health addresses the potential for smart home platforms to support new home-based digital health applications and services and the requirements for related business models and partnerships. Smart Watch: Extending the Mobile Experience examines the emergence of the smart watch as a mobile device complementing the smartphone and extending the mobile experience for consumers. For information on Parks Associates research or events, visit www.parksassociates.com, or contact sales@parksassociates.com, 972-490-1113.